The majority of my life I've been a professional photographer. Starting in advertising in 1974 I worked for the best commercial photographers in Seattle. During this time I built my own business and enjoyed 15 years shooting weddings. Custom color and B&W printing, film processing E3, E4, E6, C41, C22 and B&W in 35mm, 120, 4x5 and 8x10 sizes by hand in 3 1/2 gallon sink lines, before the advent of computers, was my area of expertise. 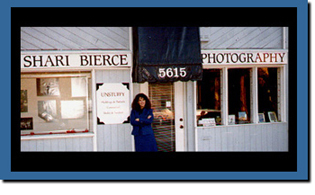 A shot of me (with my previous married name) in front of my wedding and portrait studio in Seattle which I operated in the late 80's and early 90's averaging 50 weddings a year. I have since upgraded to all digital top of the line Nikon equipment. Visit the photography page for samples and links to my work. In 1999 I decided to join the digital age and returned to school. I graduated Phi Theta Kappa in 2002 from North Seattle Community College with an AAS in Web Software Development. Photoshop, Illustrator and HomeSite I use constantly. Freehand, Flash, Fireworks and Dreamweaver are programs I have and use occasionally. Some experience with BBC edit, Access, Excel and mySQL. Familiarity with both PC and Mac platforms; 95, 98, XP, NT, Vista, Windows7 and OS X as well as FTP, SSH and other transfer programs. Some early studies in PC maintenance and repair. TCP/IP protocols. Command line Unix account management and Apache configuration as well. Since 2002 I have been freelancing in Web Development and Photography. For a list of clients and references please contact me directly. For examples of my work refer to the web design or photography pages. Music was my first life. I studied Violin from the age of 7 and continued with music throughout school. Attended Wayne State University in Detroit, Michigan majoring in Music Theory and Composition. Served as Music Teacher for grades 1 - 12 at The Friends School in Detroit for 3 years. After moving to Seattle in 1974 I played guitar with first rock and then jazz and blues combos. In the late 80's and early 90's while I was shooting weddings I played constantly in the greater Seattle area with a blues band called "The Night Crawlers". That was a great time for the Pioneer Square blues scene. For more information about my music or samples of my recordings, please contact me.